Thrasher is the Original Skateboard Magazine founded in 1981 and supporting skateboarding ever since. Awesome skate clothing and accessories. 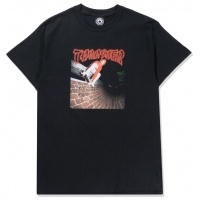 Mark Gonz Gonzales drop of tees with Thrasher Mag is absolutely fantastic. This is probably the best in the range, the pink 'Do I Look Like A Street Skater' Cartoon. In celebration of the Thrasher x Habitat video collaboration Search The Horizon, Habitat mastermind Joe Castrucci created this exclusive 'Dark Forest Goat' T-shirt. This is a limited-edition item, and will only be available while supplies last. Part of the super limited Quick Strike range from Thrasher Magazine, this China Banks Tee features the living legend that is Mark Gonz Gonzales.